Our readymade script experts developed a new Employment Scriptfor the jobseekers and employers to get the valuable source of the information about the recruitment or hiring of the employers in the single site. This script is unique from other job portal sites with advanced features and functionality, with user preferable customization. The main functionality of the script is that the job seekers can build their own resume by using the enlightened membership plans to get the professionalized job seeking resume which helps the recruiters to the qualified employers for their companies. This script is thebest outcome source for the new entrepreneurs to startup their business by using our readymade job portal site without any technical knowledge about the script. This Job Board Softwareis designed with the Two Factor Authentication secure method for the users to login to the site, the new users can register their profile with their mail id and account confirmation is sent through respective user mail id to avoid the unauthorized person to access the site. In the center of the home page, the jobseekers can find the most popular categories of the job postings where they can browse the required category, Phpscriptsmall offers you the unlimited job listings categories for the users to avoid the complexity of accessing the site. Our Responsive php job site scriptis made with open source php code where the site is more reliable and can be made flexible customization based on the user requirements. It is the easy way to find the recent jobs for the jobseekers without any struggle, this site has unique menus like job pages, jobs pages alternative, resume pages and pricing table etc, for the users to get better accessibility of the site. 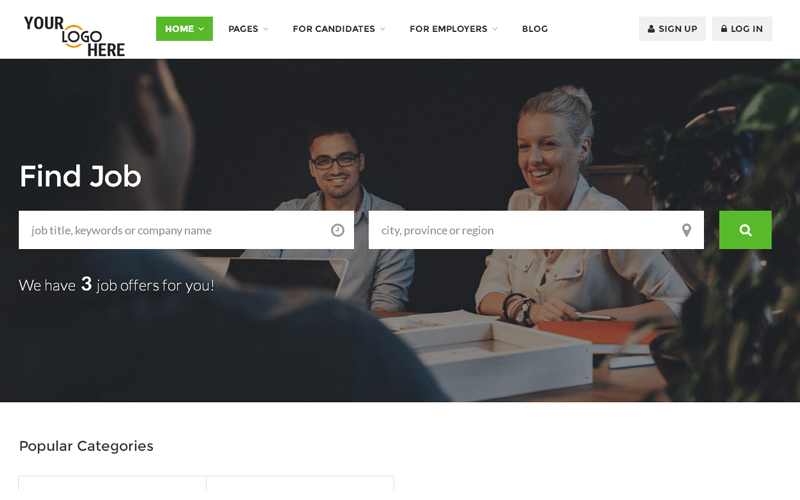 The jobseekers can bookmark their favorite job for easy accessing, this Employment Script is more flexible for the users to export their resume, make advanced job search and can get the recent updates on the blog’s content about the jobs information. The site admin has the general role to manage the entire site by managing the Job Board Softwarewith user-friendly appearance. All the job listings, resumes, posts, comments are managed by the admin with easy tools. The user canupgrade their plans by using the online payment gateway. In this Responsive php job site scriptthe users can submit their id for the newsletter to get the regular updates about the job hiring information. The main unique functionality in this job portal site is that the Pricing tablewhere the page consists of secures E-banking and the details of the user will be encrypted from other’s view. Phpscriptsmall in addition will offer you along with the purchase of the script making brand-free site, 1-year technical support and 6 months free update services and 24×7 technical support team help for your solution. I like the functionality, nice script! Wow this is exactly what I have been searching for; it would be great to work on it. Keep up the good work. I had bought an employment script from PHP Scripts Mall about last three week. Yep, the ability to add sites to take jobs from is fantastic, especially if you want a niche site covering one specific market sector. It shows your hard work.. carry on with cheer up mind.. Have a wonderful future.